"I'm just not making the sales I need!" I’m frustrated. Over and over again, very nice visitors file into my studio at 10:15 - 10:30 AM and ask me “What time do all the other artists show up?” That’s such a good question. And when I answer with “some of them will open at 11:00 I think, and then others — who knows?” they sometimes get short with me. I understand that angst. People travel to Asheville and they make their way down to the River Arts District in the morning and they’re greeted with what looks like a ghost town. At 10:00, I’m one of just a handful of studios open. What’s frustrating is that some of the artists that are not around are the very ones I hear complaining about sales. “I’m just don’t make the sales I need to make it worth it to be here”. But…if you’re not open, how will you make sales? So if whoever is reading this is an aspiring artist who would like to do this full time, here’s some advice: Look at creating and selling art as a full time job and have regular (and consistent) hours. Then advertise those hours. I know there are lots of artists who are part time in their craft. I totally get that. That was me for many years. So just make it a goal to be “open” as often as you can. And think about finding other part time artists form a co-op and publicize that you’re open! Invite people to visit. Advertise! If you go in with other artists, that makes all the shared costs a lot more possible. I really want to see other artists succeed, and that can’t happen if people do not see the artwork they are trying to sell. And if the doors are locked, no one will see the artwork and…hence, no art sales. It’s not rocket science. My wife Joy and I delivered a painting recently to some clients of mine in Austin, Texas. It was so nice to see the home my painting would become a part of (it was magnificent by the way!). After the delivery, we spent the day exploring several of the art galleries in town. The first gallery we visited was amazing. If you have not read my post on that visit, please click here first, then return to read the balance of this post, because that post will have a very different tone than this. When we left that first gallery, I was really excited about what else Austin had to offer. Granted, we did not see every other art gallery in town, but we did see several and honestly, the rest left me feeling really frustrated. I hope it’s okay I say that but it’s really the truth. I know a lot of people who just do not visit art galleries any more because they think they obviously just don’t “get” art (because of some bad experiences with it in the past). If you are one of those people, I get it. If I could do anything, I’d just want to encourage you to keep exploring the art around you. Art is the voice of the culture, and so it’s really important. That said, the voice I heard singing the rest of the day in Austin was pretty off-key, and left me not only discouraged, but really frustrated. Why frustrated? Well, if you want someone to appreciate your 12” x 18” piece of artwork priced at $8500, don’t make it something that looks like anyone could do it. There. I said it. In my opinion, really great art should wield the power of mystery. It should force you to wonder “Oh my gosh, how did they DO that?”. Over and over again though, the rest of the day in Austin, I was confronted with a lot of art that honestly left me thinking “If I had two hours and the right materials, I could make this myself”. Granted, I am an artist too, but still, if you are going to charge several thousands of dollars for something that I’m pretty sure I could recreate in 120 minutes, something is wrong (isn’t it???). I am an artist in Asheville, North Carolina and I have an open studio there in the River Arts District. People come into and out of my studio all day long and so I hear a lot of comments. There are plenty of people who do not like my artwork (I can hear them making comments since I’m standing right there). So I totally understand that everyone has different taste in art and that’s totally fine. And because of that, some people will value types of art that I do not. But if an artist is going to charge several thousand dollars for a painting, whether I like that style or subject matter, I would hope I’d appreciate the skill involved. With any painting, that skill is what you’re paying for. I don’t like a lot of abstract art. I don’t like cubism. I don’t care for a lot of Pointillism. But I can appreciate the skill involved in the creation of abstract, cubist and pointtalist art. In other words, you don’t need to enjoy ANY type of artwork. But if it’s well-crafted artwork, whether you like it or not, you should be able to appreciate the skill involved. This is just my opinion, but I feel pretty strongly about it. But if you disagree, that’s fine. And if you disagree strongly enough, I can spend a couple hours creating a mock art piece and charge you $8500. Hmmmm. This could be the start of a new creative direction for me! 2019 has gone great so far! Even in this “slow” season in Asheville’s River Arts District, art is still being sold (THANK YOU!!) and commissions worked on feverishly. And…there’s even been time for me to develop my new type of artwork: the SAILS. The above photo is the beginning of my new “sail” art idea. This thin panel is shown begin covered with texture. The texture is important because it not only makes the eventual painting more interesting, it catches light and creates shadows. That’s especially important with a piece of artwork that is “abstract” in nature. The challenge with the texture is that it needs to be FLEXIBLE. It’s flexible because eventually, this panel will be permanently set in a flexed position as it attaches to the wall. So I can’t use my “go to” materials (modeling compound and gesso) because they will crack when flexed. But after some experimenting (and several trips to several art supply stores), I landed on the right material. Initially, was picturing these panels in flexed positions in a vertical or horizontal row. The three prototype pieces i’m working on now all fit into hardwood track that will mount onto the wall. But there is no reason why the finished piece of artwork would HAVE to mount in a row. They could be mounted individually at angles to each other, some mounted concave, some convex. Why not? It’s just a matter of finding the right mounting hardware (which I have by the way). Eventually, I’m seeing this turn into something that would be luminous, undulating and covering a couple dozen feet (or more??) of a wall. So…between my winter art commission projects, I’m still plodding ahead with this new idea, having a blast, and gratified the idea seems to be working (so far) without a hitch. Fingers crossed…going forward; sailing ahead! I love my job. I really love it. I’m a painter in Asheville, North Carolina and have an open studio in the River Arts District. I work around 200 other artists (within a square mile) and share a very precious comradery with them. Every day, I walk the three miles to the studio and gear up to the tasks of the day, and then walk three miles home to unwind. My life is awesome right now. People love to touch my artwork. It’s not enough to look at it, they have to touch it. And they don’t just touch finished pieces. Every time I step away from my work table, I have to put up several “PLEASE DO NOT TOUCH” signs around my work (because it’s wet paint!). Otherwise, I can come back and see foreign fingerprints. I can let this frustrate me (and it has) or insult me (and it does) but my work inspires curiosity and when I remember that fact, it makes it much easier to just deal with the inconvenience of painting over a fingerprint. Inspiring curiosity is an amazing thing and (when my head is in the right place), that makes me smile. That’s what this is all about. Every day, I have to answer exactly the same questions multiple times and honestly, it’s exhausting sometimes. The artwork I do is something no one else is doing and while I love that fact, my artwork baffles some people. Before they even look around the studio, some folks have come over to me and almost demanded “So what is that? What’s your process? How do you do this?” I want to say “Why are you worried about HOW I do this? DO YOU LIKE IT?” And that’s because that’s really all I care about. When Joy and I go out to dinner downtown and have an awesome main course, I do not go back to the kitchen and ask the chef “What is this sauce? How did you make it? !” I would never even think of asking. I’m just consumed with “I really love this sauce” or “this doesn’t taste right” and that’s all. So this area frankly baffles me. But…again, if artwork inspires curiosity and ignites questions in the mind of the viewer, is that a bad thing? I don’t think so. It can be exhausting for me as the artist involved here, but I think it’s a very good thing. I don’t want my artwork to look like everyone else’s work. I do want it to be unique. So I’ve learned to be okay (most of the time anyway) with the hundreds of times a week I’m asked this question and try to answer it with a genuine smile (because when they ask, that means my artwork has done it’s job: inspired curiosity). I love my business model. Because I work right in the middle of public setting, I get to hear all the comments people make to each other. And this is really helpful. I come up with all sorts of ideas for artwork, but I honestly don’t know if they’re all good ideas until I hang the artwork on the wall and listen to people. This can be humbling, but so helpful. This is my job, and because of that, I can’t afford to be “angsty” and put my artwork up on the wall with the attitude that if people don’t appreciate it, there’s something wrong with them. That attitude won’t fly here. I put up an idea and I know pretty quickly if it was a good idea or not. I can hear some artist say, “Okay, he’s a sell-out”. I disagree. If I want to make a living selling hot dogs, I’d better make sure people enjoy my hot dogs, right? Get some focus groups together and do blind taste tests and see what sells. I’m not saying that an artist should just abandon the passion inside and paint only what people want. But if a respect for people and their interests and tastes is not part of the equation, that artist will not be able to create full time. Unless it’s a hobby, art needs to sell and if it’s not, it’s either too expensive, or the quality is lacking or it’s not executed with the right (popular) color palette, etc. All these things need to be factored into the production of a painting that (hopefully) will one day sell. That’s probably enough for this blog entry. I’ve got more to say so…this will be continued. Let me first say that if someone by chance is reading this blog, you probably already know I’m an oil painter in Asheville’s River Arts District. I paint some abstract pieces (great therapy!) but mostly I paint local landscapes. For the record, my favorite time of the day to depict in a painting is dawn or dusk, because the light is perfect, and my favorite time of the year to depict is probably autumn, because again…the light. I love trying to capture that moment in a day that may only last a couple minutes and then it’s gone — that time when the sun colors the clouds crimson and orange and the world feels like it’s holding it’s breath, waiting for the first cricket to begin it’s song. In short, I love depicting the awesome beauty of this place. This week though has been really difficult for me and I need to write about it. So this blog entry will really be more like a journal entry. I need to get write this down or I’ll pop. I got a phone call from my 92 year old dad last week and it sounded like he had the flu, so he went to the hospital. As the days of last week slowly ticked by, we found that he has a large tumor in his colon and it’s nearly blocking the whole thing. I know what this means, and my dad does too. I knew he wasn’t going to live forever but “that day” was (in my mind) always off in the future. Grief and fear are really interesting. Most of the time, I steel my heart and I’m fine. But then there are waves that are too large, and they knock me off my feet. My plan was that my dad would live the end moments in my home. But he’s in Dallas and I’m in Asheville and this snuck up on us by surprise. By Tuesday, when they get the biopsy results back, we’ll be able to make a plan. For now, we wait. I was crying but he was encouraged. “I believe that Steve”, he said strongly. So do I.
I don’t know how long he has. Maybe days or weeks? Maybe months or years? No idea. But this is grief and I guess it’s time I become familiar with it and let it become fuel for my creativity as the waves wash over me. What does grief and creating artwork have in common? If done right, I think they are very much connected because they’re both real and honest. I found myself painting some pieces of art this week that I’m really proud of and excited about, not as a diversion from the grief and fear but because of it, propelled along by it. Strange thing. Alright. I feel better now at least getting that much down. I promise I will not regularly use this blog to vent regarding this. But this was therapeutic. Even before I became a full-time oil painter in Asheville's River Arts District, I was developing a unique way to create a painting using dimension, both in the build-up of the composition and in the finish (which has mostly been using a thick, high-gloss, solar-resistant resin). In fact at this point, I think I'm probably known for that "shiny" resin finish. I like it a lot. 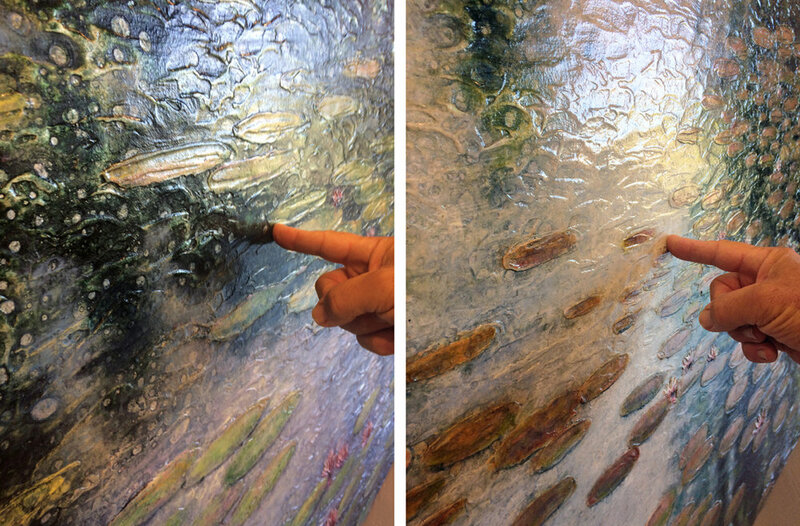 It allows me to embed flecks of gold that are essentially "floating" above the surface of the actual painting. That said, my largest commissions over the last couple of years have been with a satin varnish finish, which leaves all the texture visible (and touchable) and is not nearly as reflective as the high gloss resin. And I'm really liking the results of that finish as well. Lately, I have more and more people asking about the satin finish and so I'm thinking I need to listen. So, what do you think? One or the other, some of both? Mostly one, some of the other? I'm really open to listening. If you could leave your opinion below (so they're all consolidated in one place), that would really be appreciated! Thank you! Most of the time, being artist in the River Arts District in Asheville is a blast. I mean really -- all of us down here are living out our passion, and making a living doing it! Who could ask for a better job than that? And honestly, about 98% of the people who visit us are super nice people. Some of become regular clients and dear friends of mine. The fact that we artists don't create in a vacuum is one of the huge benefits of our "open studio" business model here in the Arts District. This keeps us socialized (which honestly, is really emotionally healthy) and ithe fact that I can see and hear what I do that resonates with visitors helps me make a living as a painter. "How Ready are you to Sell These?" "How ready to sell this are you?" "I have a group in China that copies oil paintings like this for a quarter of these prices." “Does the city pay your rent?" "Is this your 'real job'? Can you really make a living doing this?" "I've paid less for a car!" "This piece has been on your website for over three months...so...I'm going to offer to pay you 50% of the prices..."
"Does your job give you insurance? I couldn't take a job without insurance." Woman entering and looking around the studio: "Are all the pretty paintings gone?" Man looking around at the walls: "this must be the stuff that doesn't sell right?" "It's so sensitively done! I thought for sure the artist was a woman!". "Can you give me a break on sales tax?" "Do you have any 95% off prices?" "Did your real job not work out, so now you're here?" Visitor showing the artist photos on his phone: "I wouldn't charge you much if you wanted to use any of these photos. Just pay me a commission if your painting sells." "Oh, the kids make those." A few weeks ago, a woman came in the studio with her little high strung, fashionably dressed miniature curly haired dog and after a few minutes of browsing she walked quickly up to me and asked where her dog could pee. "It's a nice little hobby you have here." "I would love to just play like this all day but... I have a job." A man came in to our studios, looked around quickly and then asked me where she could find "fine art". "I absolutely love your work! I always go to the ***** art auction and I always look to see if I can get one of your paintings at a good price." As an artist who usually just paints local landscape paintings, I don't usually think about my "world view". Most people don't give their own world view any thought at all but that view affects how we interpret EVERYTHING here on this planet. So, because we want (I assume) to understand art, we really need to consider the world view of the artist so that we can accurately interpret (and maybe even enjoy!) a piece of artwork. The previous world view we looked at was the "abyss" of Nihilism. Because the ramifications of this view are so dark, it gave way to the next: Existentialism. I think Existentialism is interesting. In some sense, it is a "softening" of Nihilism. Again, Nihilism asserts that we are all here by chance and in a few billion years when the sun explodes there will be no trace we ever existed and so nothing anyone does ultimately matters at all. In Nihilism, concepts like "fair and unfair", "good and evil", "right and wrong", "meaningful and meaningless" are not based in reality at all and therefore are technically baseless philosophical constructs. The results of a strict nihilistic world view left a lot of people pretty depressed because like it or not, most people intuitively desire some sort of transcendent meaning in life. Human beings like to at least feel like some things really do matter, and nihilism gives no basis for that assertion. Existentialism showing up on the scene when it did brings to mind an analogy. Imagine the world is at God's funeral -- people everywhere are quiet, weeping, downcast. As the pipe organ is finishing up the dirge, Stephen Colbert steps up to the podium and starts cracking jokes. Soon, everyone is laughing hysterically. Existentialism is the joke-teller at a funeral. Existentialism asserts that yes (as per nihilism) there’s no God but…good news! We don’t NEED a God! We’re free! We can do whatever we want! We can be who and what we want. Existentialism asserts that we’re not accountable or dependant on a grumpy deity out there somewhere. Individuals are free to create the meaning and essence of their lives, as opposed to deities or authorities creating it for them. In existentialism, like it’s predecesor Nihilism, there is no true truth. There is no right right or wrong wrong. But existentialism deals with our penchant to at least “feel” like there are propositions that are true and false, right and wrong. This world view deals with that “desire for truth” by asserting that a belief can "become" true to you when you act on it. This allows people to basically come up with “boutique truths”, customizable truth for every person on earth. I've left no time to feel. or to those close to me. is somehow going to last. So I have a question. What’s your reaction to this poem? Take a look at it. What do you notice? Any thoughts?